* Comes in Men's Large & X-Large! Show your Hoosiers pride right down to your toes and Adidas crimson and white chevron patterned socks are a great way! 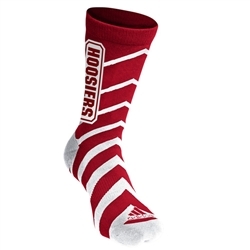 These quarter length socks are designed with chevron stripes in crimson and white with IU design woven into the pattern. Adult Men's sizes.